What are float drags? 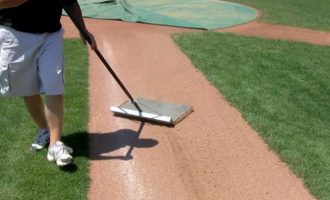 They’re used to smooth your infield surface after game play or nail dragging. You can use a float drag pulled by a tractor, or you can use a manual hand float drag. 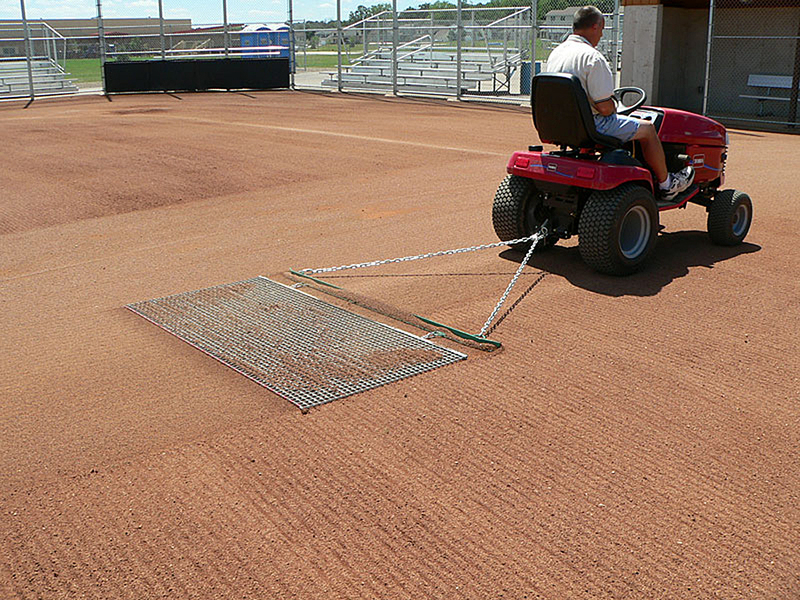 In any case, they are intended to level your infield as part of your finish grooming. 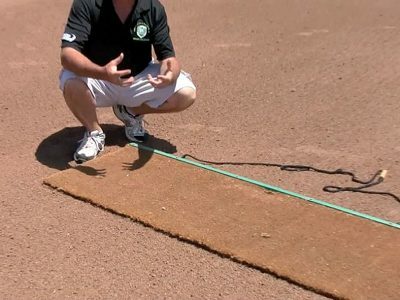 Using float drags will give your field a smooth, uniform depth of loose material on the surface for more consistent bounces and better resiliency. There are two types of float drags: steel mat drags and cocoa mat drags. 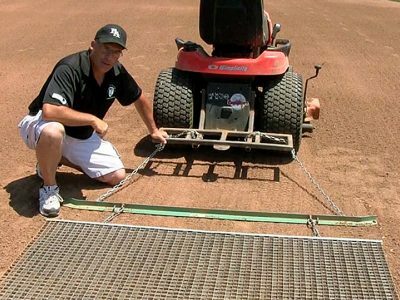 The most commonly used float drag is the steel mat drag, because they work well no matter what type of material the infield skin is made of. 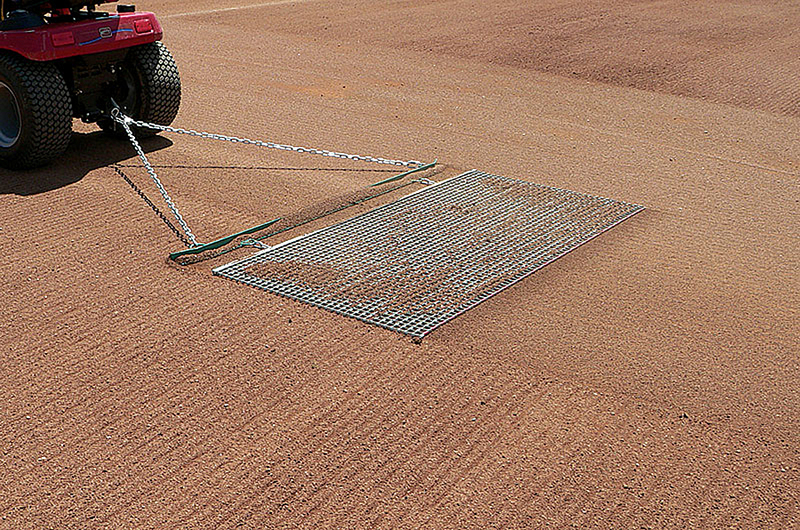 Steel mat drags will break up soil chunks and transport some of the soil from one area of the infield to another. 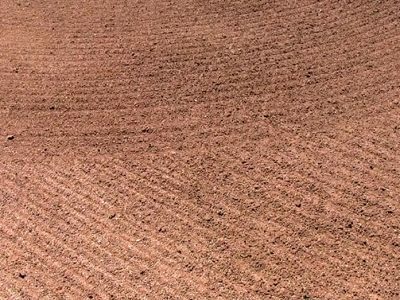 Using a leveling bar with a steel mat pulled behind a tractor will really knock the soil down and redistribute material, filling in low spots from areas where loose soil has accumulated. 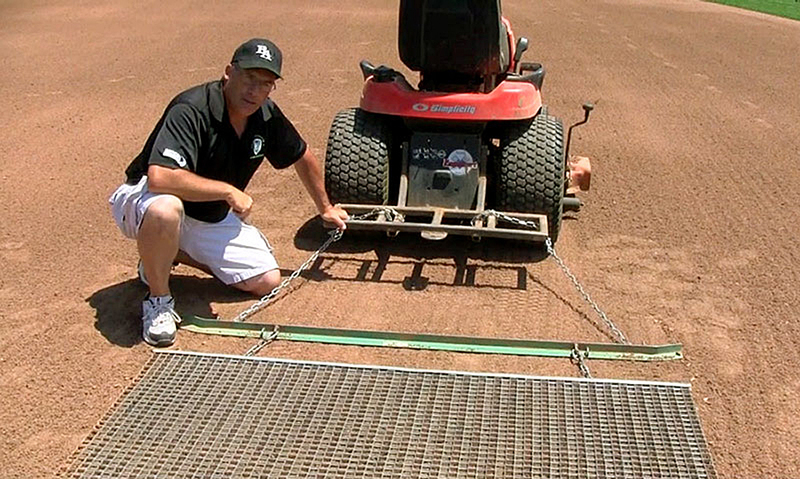 A stiff steel mat drag works well for a hand-pulled drag. These manual float drags do not usually extend back as far as towed drags. This makes them easier to pull by hand since less material is pulled along due the smaller foot print of the drag. Another great float drag is the cocoa mat. These drags just literally float over the surface with minimum drag of material. 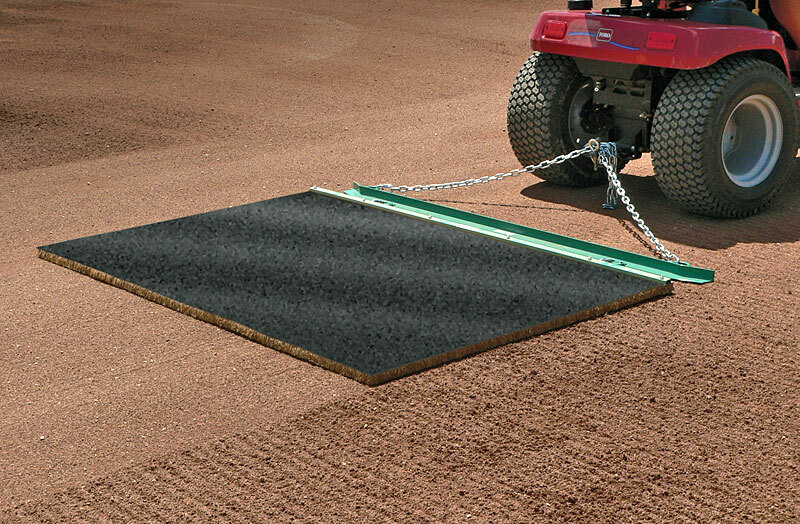 With it’s dense fiber they smooth over the topdressing with very little transported material, meaning you can start and stop wherever you want. 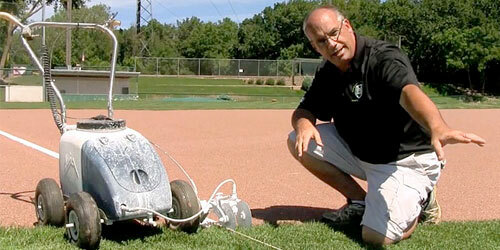 This style of float drag is recommended only for an infield with topdressing. 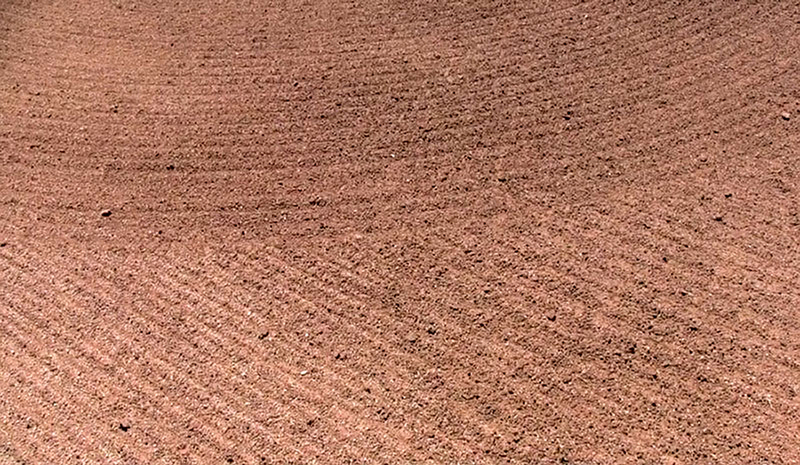 It will not break up soil chunks, so that’s why it’s not the best drag for soil-only fields. The cocoa mat is also excellent for damp fields after a rain. 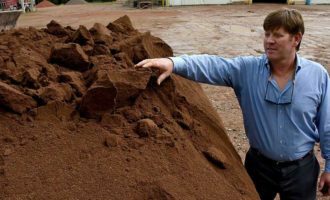 A steel mat may collect additional moist material but the cocoa mat will pass right over, smoothing topdressing without collecting excessive damp soil. 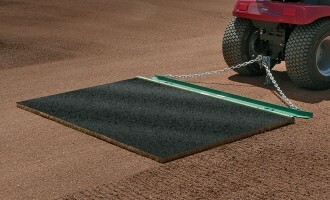 The cocoa mat is at its best when used in combination with a leveling bar pulled by a tractor. 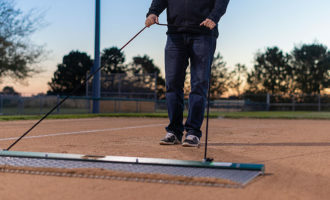 A smaller cocoa mat hand drag is excellent for along the base paths and around home plate. 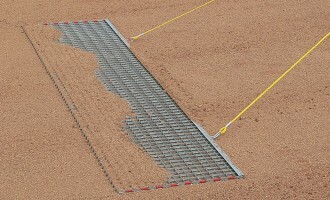 When float dragging with a steel mat drag, starting and stopping is very important. With the transporting of material while dragging, the operator must be aware of where they begin and end. 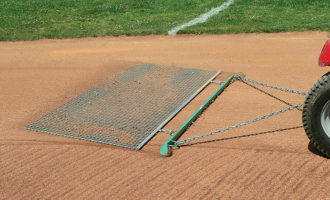 A steel mat drag can gradually manipulate the surface grade of the infield. Wherever you start, the drag will load up with topdressing or soil. Wherever you stop, the drag will deposit the soil or topdressing that was collected by the drag. So, wherever you start the drag is also where you should finish, so you replace the material you pulled away when you started. 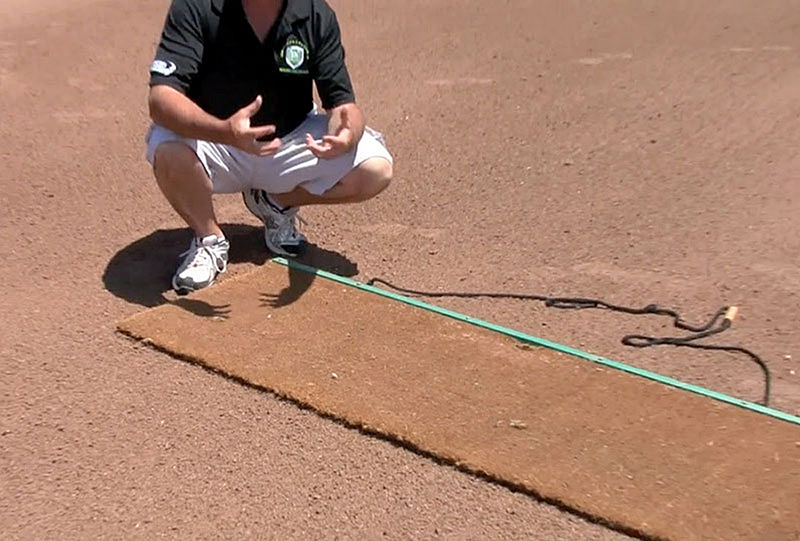 High spots and low spots will develop over time on baseball and softball infields. 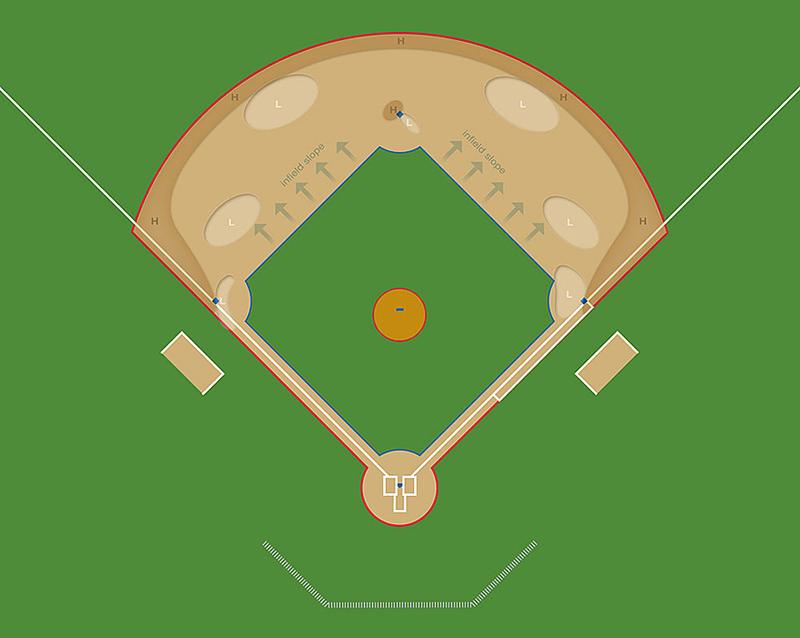 These areas are the result of player footwork, infield maintenance practices, and good ol’ Mother Nature. 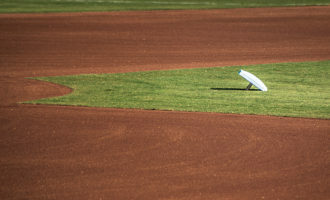 Remember that soil and topdressing will move across the infield with help from rainwater. The heavier the rain, the more material is displaced. 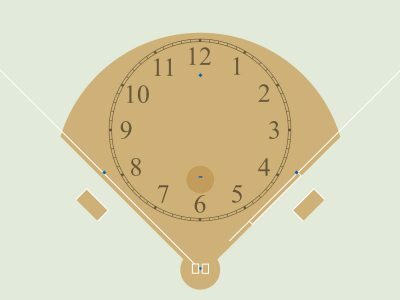 The movement of the soil will follow the slope of your infield, which is typically toward the outer edges for better drainage. 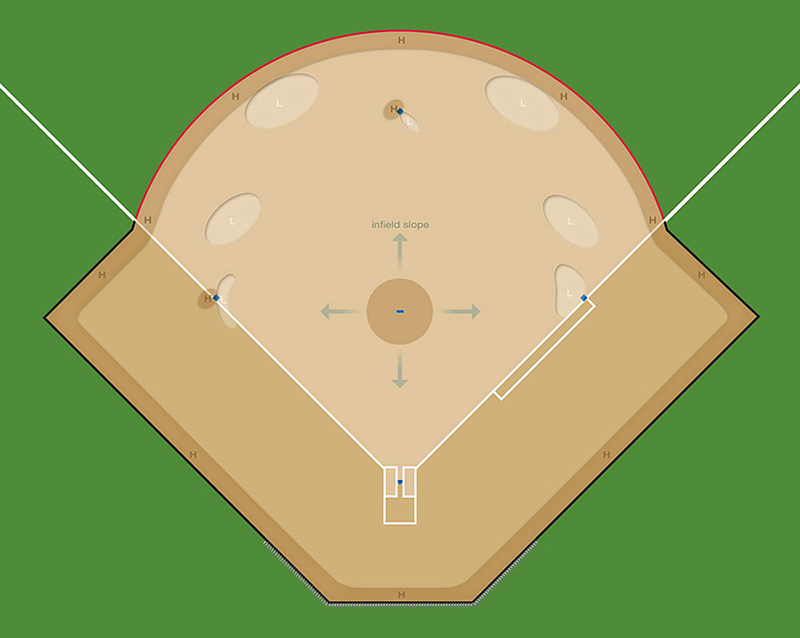 Click these images that show the areas that most commonly become high or low spots on traditional grass infields and skinned infields. Staying ahead of Mother Nature is the challenge. 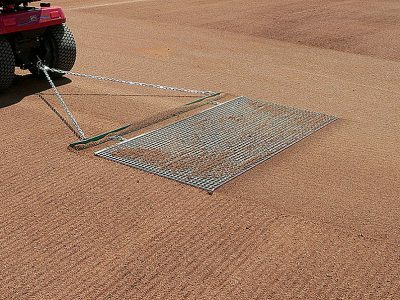 Using your steel mat drag to pull topdressing or soil back to the highest elevations of your infield skin will help maintain proper slope for optimum drainage. You can use the same plan of attack that you used with nail dragging (see previous section, slide 5). Remember the “clock” method? It works great for float dragging as well. 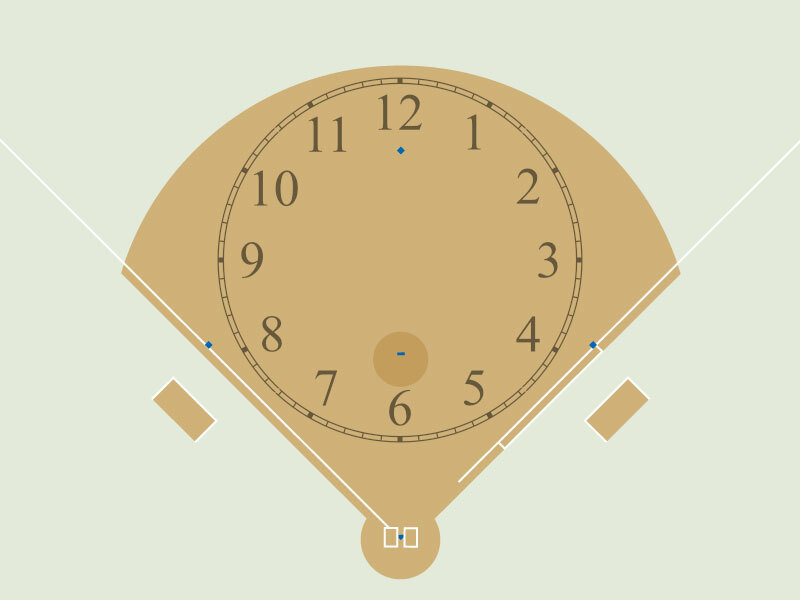 Using the face of a clock as a guide, determine where to start and stop, just as we described in the previous section. Rotating your starting and stopping points won’t completely stop degradation, but it will drastically slow it down. That’s a lot to know about dragging. You now know what goes into nail dragging and float dragging. To keep things straight, it would be a great time to review this section before moving on. The next section will show you dragging patterns, but first log in to try this Pop Quiz so you’re sure you remember all that goes into float dragging.